In Luxembourgish we have regular verbs – reegelméisseg Verben – and irregular verbs – onreegelméisseg Verben and modal verbs. The auxiliary verbs – sinn (to be) & hunn (to have) – are irregular. Each verb has a basic “infinitive” (to) form. This is the form of the verb you find in a Luxembourgish dictionary. The verb to live in English is the infinitive form. The Luxembourgish equivalent is wunnen. Each verb has 2 parts: the stem and the ending. In the verb wunnen wunn is the stem and en is the ending. The stem is invariable except in the irregular verbs. The ending is the flexible part of the verb and changes according to the subject and the tense. The ending of all the verbs at the infinitive – with the exception of the auxiliary verbs – is –en. 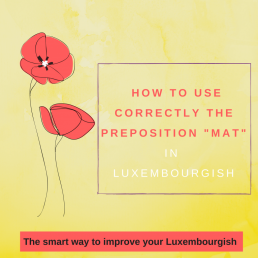 Once you learn the pattern for one regular Luxembourgish verb, you know how all Luxembourgish regular verbs are conjugated. (Yes, there are irregular verbs that don’t always follow the rules, but even they will usually have the same endings as the regular verbs.) The majority of Luxembourgish verbs are regular, even though it may not seem that way since many commonly used verbs are irregular verbs. In this lesson we will only talk about the conjugation in the present tense. The conjugation of the regular verbs always follows the same pattern. The conjugation of irregular verbs follows a predictable pattern: only the 2. person singular (du) and 3. person singular (hien, hatt, si) change their stem. That is, the verb changes its stem vowel, but the endings are the same as for any other regular verb in the present tense. Each modal only has two basic forms: singular and plural. This is the most important rule you need to remember about modal verbs in the present tense. As an example, the verb kënnen has the basic forms kann (singular) and kënnen (plural). For the singular pronouns ech, du, hien/hatt/si, you will use kann (du adds its usual -s ending: du kanns). For the plural pronouns mir, dir/Dir, si, you will use kënnen (dir/Dir takes its usual -t ending: dir/Dir kënnt). You can watch this lesson on Youtube! I will go more in details about the modal verbs in a future lesson. I hope that this lesson was helpful. 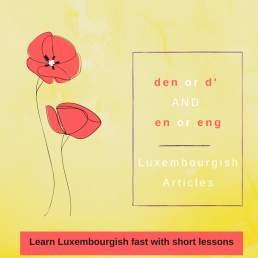 If you want to learn Luxembourgish from scratch but you don’t have time to attend classes then my online course Easy Luxembourgish Level 1 is for you!